The Professional Regulation Commission (PRC) officially released the 2016 schedule of board examinations based on resolution No. 2015- 948 signed on November 4, 2015 which includes deadline for filing applications, practical examinations, professional upgrading examinations, Special Professional Licensure Board Examinations (SPLBE) and target dates of release of examination results. The new resolution on schedule of board exam for 2016 signed by Angeline T. Chua Chiaco, the Acting Chairperson of PRC was announced earlier compared to last year. The Special Professional Licensure Board Examinations (SPLBE) to Overseas Filipino Workers (OFW), shall be scheduled in accordance to PRC Resolution No. 2011-627 pursuant to R.A. No. 8981 and Executive Order No. 835. In the Board Licensure Examination for Professional Teachers (LET), PRC advised that requests for additional testing centers outside the PRC Regional Offices shall be in accordance with PRC Resolution No. 2012-675 series of 2012 dated August 24, 2012, "Designation of other cities outside PRC Regional Offices as additional testing center for LET." 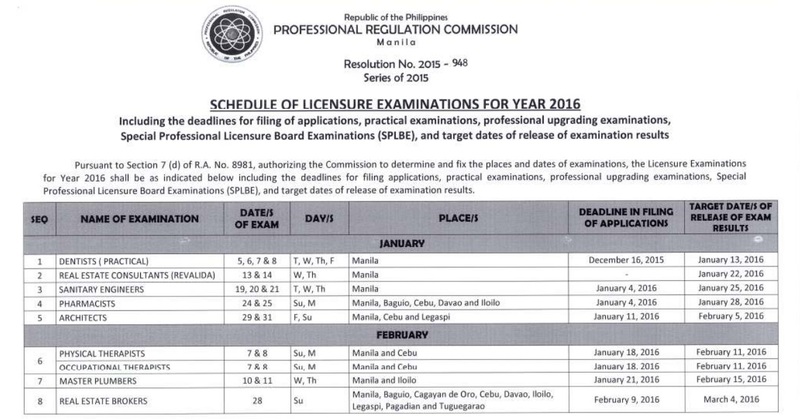 Here is the copy of board exam schedule for 2016 from PRC. Share now for the reference of other examinees. TheSummitExpress will continue to deliver news and results of the 2016 board examinations. Like Us on Facebook or Follow Us on Twitter for the updates.